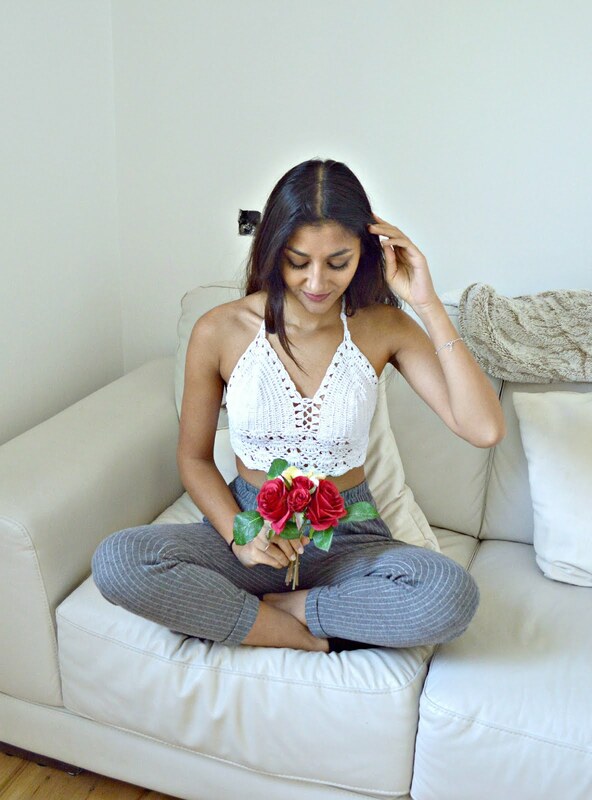 I've decided to start something new on my blog! As I'm currently working on my drawing/designing skills I thought it would be a fun idea to get you guys involved too. So instead of just drawing random outfits, I decided to do a new 'series' of posts. This new 'series' is basically outfit sketches based on your style. So if you would like to get involved, all you have to do is be following me on bloglovin' (or by email) & twitter, and DM me that you're interested! As much as I love sketching, I also thought it would be the perfect way to get to know you guys a bit better. I hope you enjoy this first post, and be sure to let me know what you think of this idea in the comment section! I love colors but I normally wear neutrals, I usually go for comfy casual over anything. Like some dark jeans and high boots & sweaters are my go tos, sometimes I’ll throw a skirt on with tights but casual is more my forte. All of my summer styles are boho chic I would say. To create the comfy casual look, I went with simple trousers, a floaty v neck top and, a chunky oversize sweater. As Charli mentioned she usually wears high boots, this is what I went for to finish the look. I thought the oversized patterned sweater and little bobbles worked well to create that boho chic style, alongside adding an element of fun and lightness to the outfit. For the first colour set, I decided to focus more on the boho element of the outfit. Using more earthy tones for the sweater and contrasting this with the redish-orange pop of the trousers. 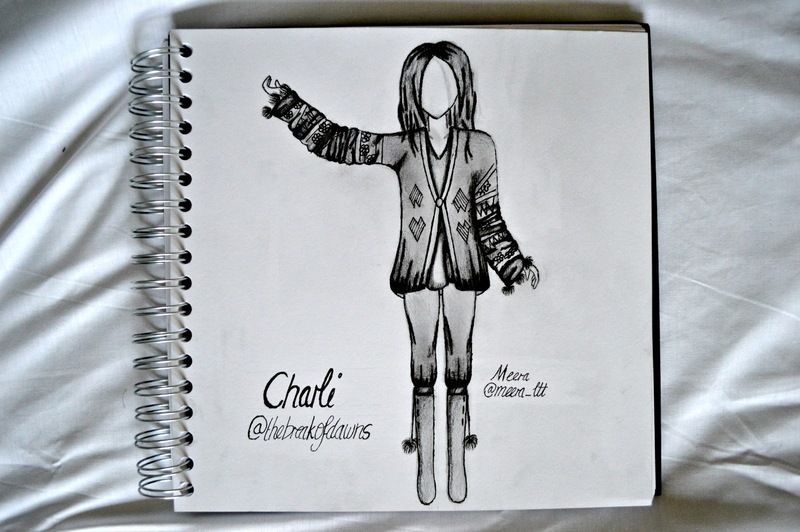 This was mostly influenced by Charli's red tights in her twitter PP, which I think look great! For the second colour set, I decided to create a more bold sweater. Being the main focus of the outfit, I thought a bright pink and burgandy would help to create that festival/boho look. I paired this with toned down blue wash jeans. In both I decided to keep the boots and top neutral, as not to detract from the statement sweater. I am 19 years old and am from Switzerland. I am currently studying product, jewelry and accessory design in Geneva. 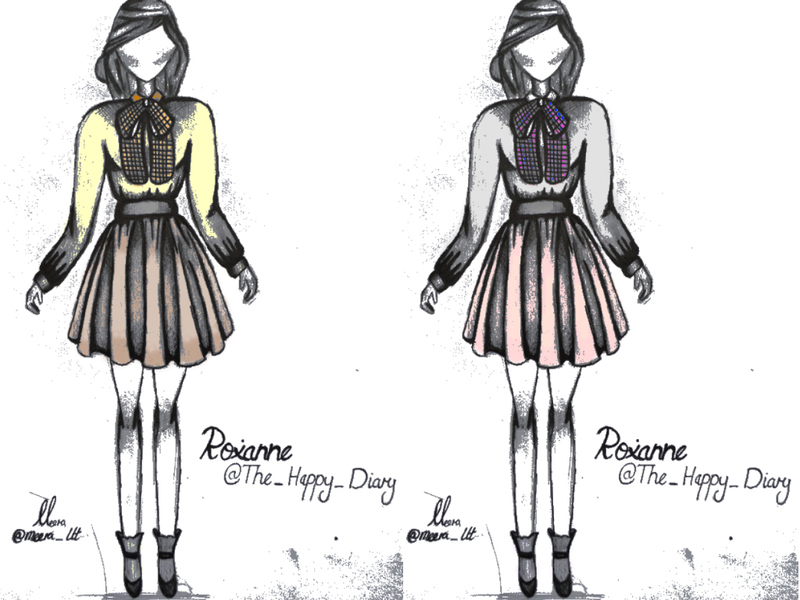 Outside school, I have a beauty, fashion and lifestyle blog called The Happy Diary. I am a beauty and fashion addict! My favorite high fashion brand is Dior, because it matches my style a lot: feminine, elegant, delicate, lots of fluid light materials, embroidery. I like simple feminine outfits, just simple but effective with staple items. I am an introvert, I try to be the kindest possible and stay positive no matter what. I like to laugh a lot too! 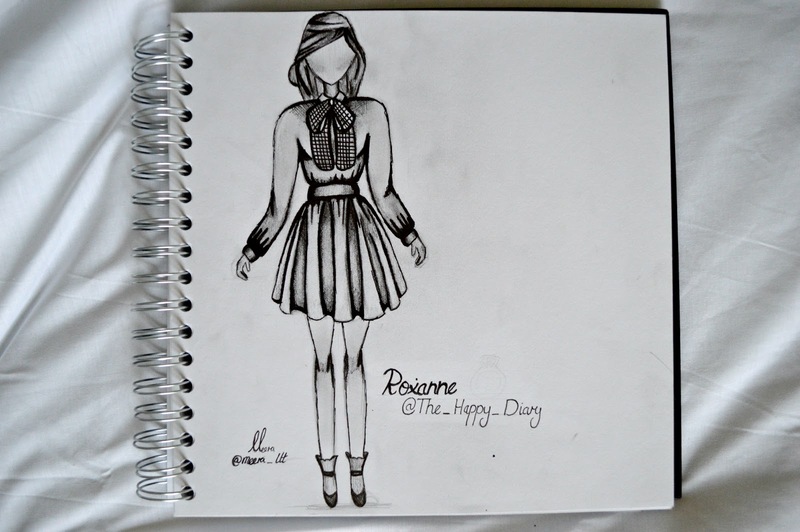 For Roxanne I decided to first research some Dior clothing and look into their style. I noticed they do a lot of floaty skater style skirts and statement tops. In order to create that feminine look I went for a simple high waisted skater skirt (cinched at the waist to really highlight figure) with a sheer blouse. Considering Roxanne is into jewellery and mentioned she adds statement pieces to her outfit, I went for a slightly more extravagant bow tie. I thought this added a little extra to the outfit without being too over the top. The lack of pattern and heavy materiels aims to reinforce that elegant style, while at the same time, reflecting a more introverted personality. I decided to go for muted toned in both colour picks, in order to, again, reflect Roxanne's calm and introverted personality. In the first one I decided to go with a muted yellow shirt to bring out the idea of positivity and kindness. I paired this with a more dulled down brown skirt. For the second one I decided to go for both a muted gray shirt and dusty pink skirt. In this one I really wanted to the focus to be on the bow, a checked blue and pink, which was inspired by one I saw in a dior show. 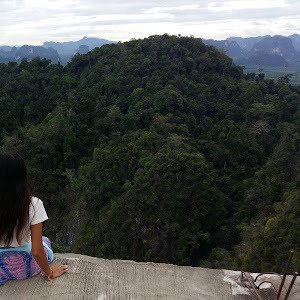 I’m a music and travel blogger so I go to a lot of concerts and also travel quite a bit! I usually wear black high waist skinny jeans and a black t shirt of some sort, I like the distressed clothing a lot! If I’m wearing something a lil dressier I usually still wear black but with like thigh high boots! 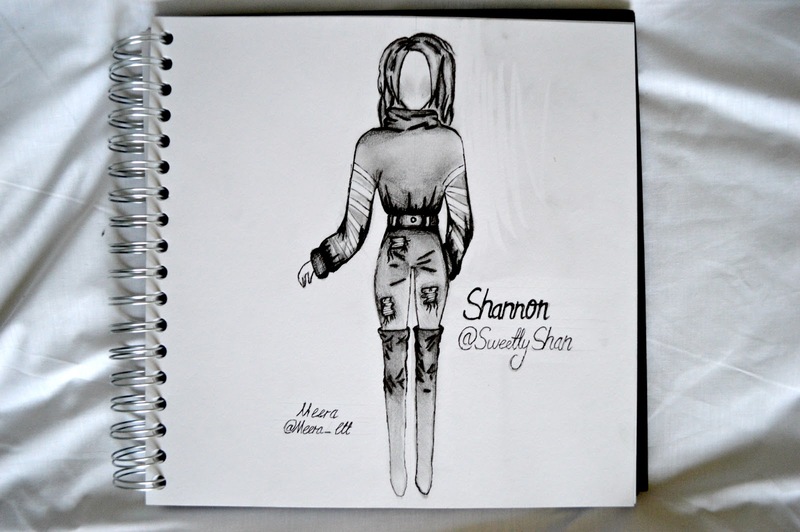 I decided to mix it up a little and merge Shannon's dressy and casual outfit together. I started with black distressed jeans and an oversize roller neck jumper. Although it doesn't strictly go with Shannons t-shirt look, I thought the jumper might create a little bit more of a statement look without going too over the top. I also thought jumpers make the perfect travel outfit! The stripes on the sleeves mix well with the ripped jeans to reinforce the casual side of the outfit. I paired this look with some simple over the knee, black boots. 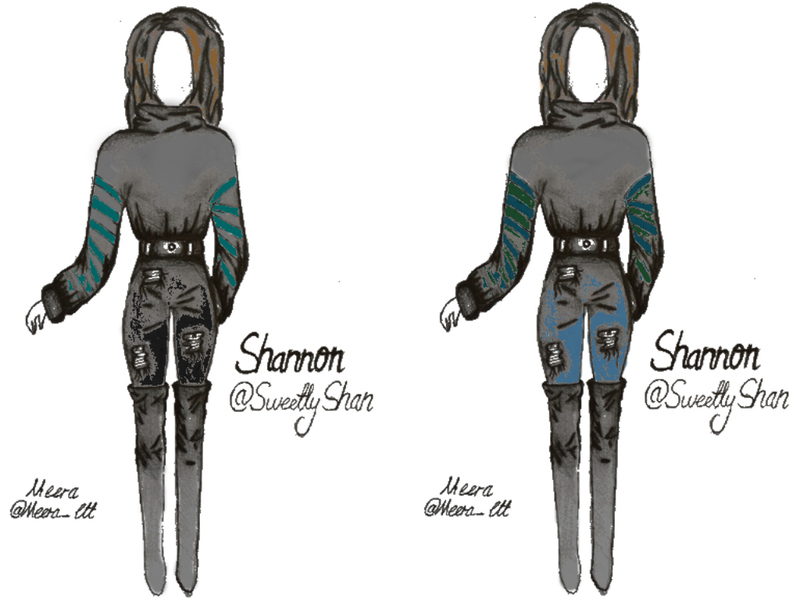 As Shannon mentioned she usually wears black so, I decided to keep both colour picks quite simple. In the first I just went with black jeans and a grey jumper. I mostly added in the dark green stipes for a pop of colour. The second colour pick is fairly similar but with dark blue jeans and some added blue stripes to further tie the outfit together. I went with simple black boots for both. Hi I'm Giana! 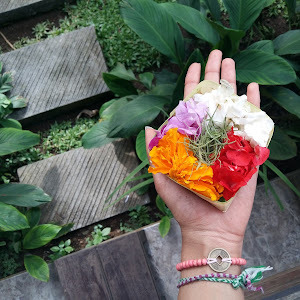 I run a lifestyle and travel blog called 'Tea With Gi', sounds like a PG tips ad line, is actually based on the idea of reading blogs while drinking tea. I’d like to say my fashion sense is 50’s glam mixed with 70s flares and a large collection of crop tops. The only time I haven’t got lip stick on is when I’m going to bed. Despite all that I’m happier in a pair of trainers or flip-flops than heels. 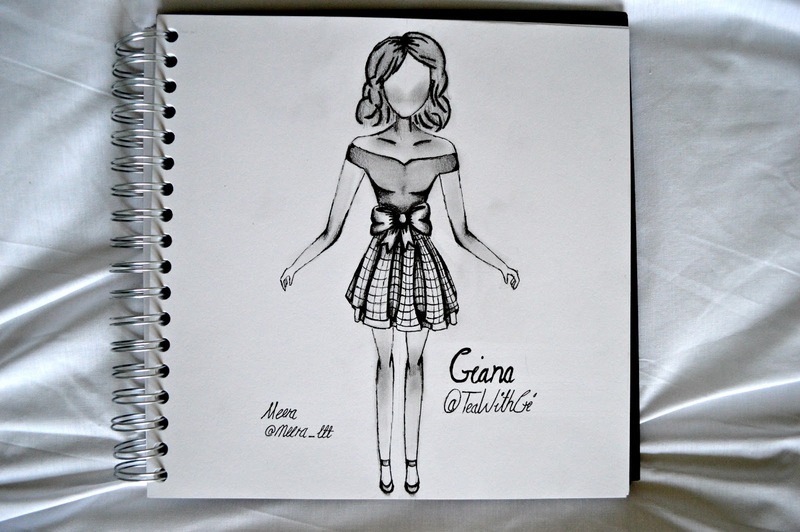 While I love both 70's and 50's fashion, I decided to go for more of the 50's vibe for Giana. I noticed in her PP she's wearing a beautiful red dress with a lovely sweetheart neckline which I thought looked great! I decided to copy this neckline but pair it with more of a classic 50's style, big skirt, cinched waist, dress. I did, however, ditch the long style of the 50's and instead go for a shorter skirt, which would've been more seen in the 70's and now in current times. I decided to go for a checked skirt, and big bow, which keeps in line with the 50's vibe. As Gi mentioned not really wearing heels, I went for a simple pair of flats. For the first colour choice I went for a more toned down pink palette. 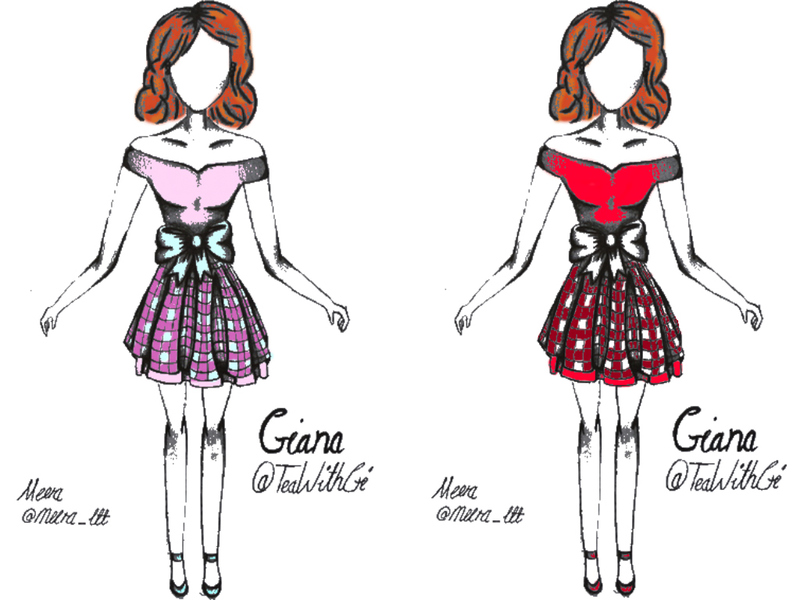 The checked skirt was inspired by a 50's dress I found on google. Personally, I think the use of pastels always creates a a more delicate feminine look, something that I love. For my second colour palette, I went for reds. Gi mentioned that she loves wearing lipstick, and I thought with a red lip this outfit would look perfect. This second choice is definitely more statement, but, I think, perfect for going out to fancy events. I also think this colour would go perfectly with the colour of Gi's hair. If your interested in being part of my next post like this, just make sure you're following me on bloglovin' and twitter, and drop me a dm. Don't forget to let me know your thoughts below too! Which one is your favourite? This is such a cool concept. I love it!! I love this so much! Awesome girl! The sketches are amazing! 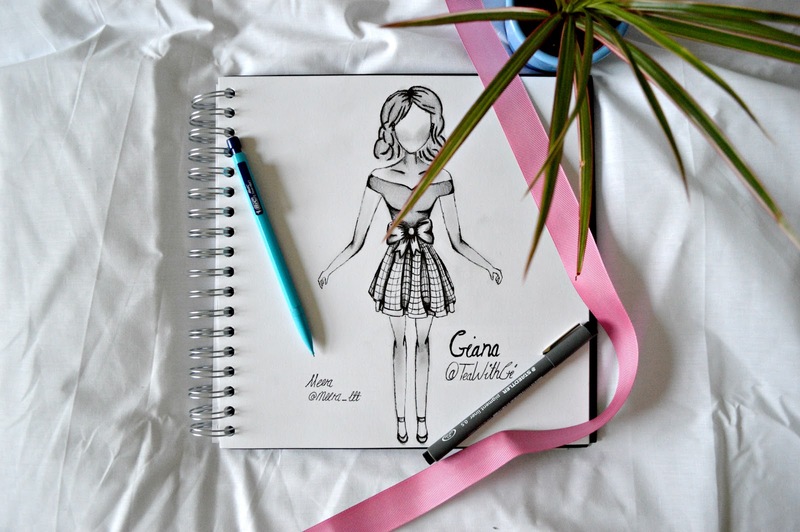 I love this idea, it’s so sweet that you want to sketch outfits for others! Oh my godness, all the sketches are stunning!! I love mine so so much, thank you❤️❤️ You are super talented! 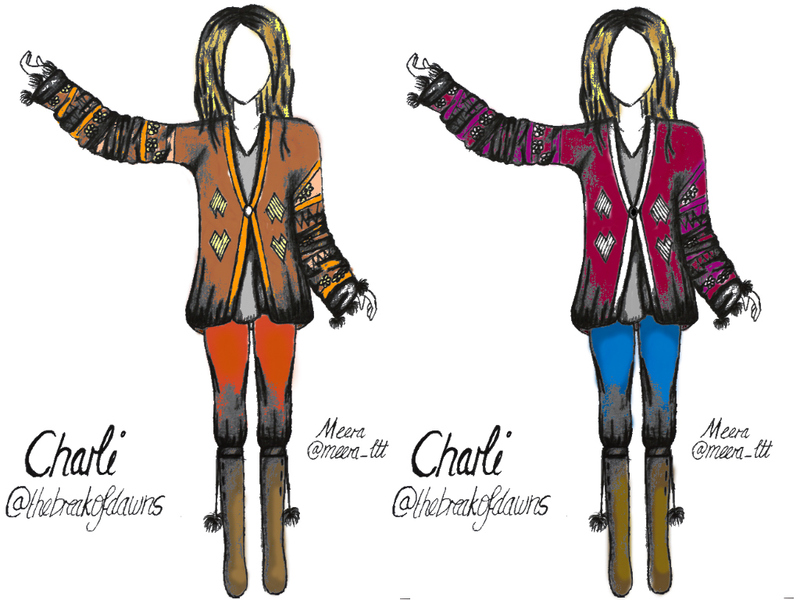 Your sketches are amazing Meera, loving the designs as well. Keep sketching and sharing! This is such a cute idea! You're so talented! Can't wait to see more of your sketches! Oooh i Love it! You’re so talented! I wish i could draw like you :)! aw thank you Kelly :)! They all look awesome, great job! Can’t wait to see more! This is such a cute idea! I'm totally Giana! these are amazing, you are super talented! You are so talented!! Keep up what your doing, it looks amazing :)! This is SO creative, I love it. You're so talented! Hope you have a lovely start to the week and can't wait to see more! It encourages a craftsman to demonstrate his illustration capacity by concentrating on various parts of a specific subject. You can utilize numerous things as an illustration medium, for example, a pen, pencil, watercolors, mud, and so forth. 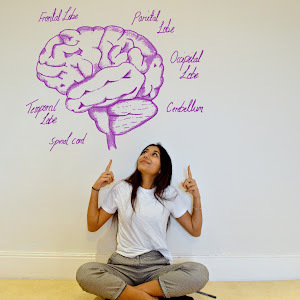 Brain stuff - Why do we feel sad? Discuss - Is social media healthy? Meera's Blog © . Design by FCD.